The Long Secret to a Boot Shine – and other more important things. Recently, I got a new pair of boots. The last pair, despite my best efforts, had worn out in ways that were testament to the work I’ve done on land – hard work. I take care of my footwear. Mink oil. Polish. Things I learned over the years. These new boots typically hold a spit-shine after I broke them in. It’s just my thing, something I do, something I’ve done over the years. It’s a meditation by itself, a focus on the moment, in the moment, completely about the moment – mindfulness in one of it’s forms. Someone recently asked me here in Trinidad and Tobago how I get my boots to shine like that. I thought nothing of it; I said, “Polish.” They responded that they knew that, that the shine I got was different than the ones they saw. I explained the mechanics of a spit-shine as a short explanation, knowing they probably wouldn’t get it right. It takes practice. 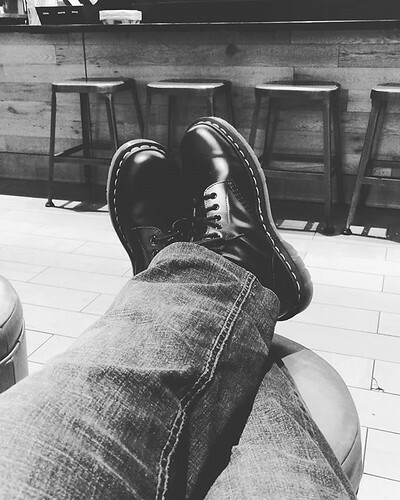 It takes continuous improvement – Kaizen – practice and more practice on the boots, an evolving landscape of polish and leather. The truth of how I do it is much longer. These days it takes me minutes to get the boots up to my standard – but it’s really taken me my lifetime to get it right, and it never started with polishing boots. That came much, much later. This is the longer story of why my boots shine. When I was transplanted into Trinidad and Tobago, I didn’t feel like I fit, and people gave me great pains to remind me of that. I had a strong sense of self even then, of who I was even when I didn’t fit in – I defined myself by my own standards. This is said to be common amongst Third Culture Kids (TCKs), I don’t know. I only know one – me. So, surrounded by other culture, removed from another, and with solace found mostly in books, I found James Clavell’s “Shogun” to be an introduction to concepts that worked for a young man. Honor. Commitment. These sorts of things have a strong appeal. The world around me made little sense, and the people around me made less sense – but the book made sense. In the 1980s, too, Japan was forging ahead in technology, thanks in part to Deming – something I didn’t know at the time. They were dealing with what they called 5th generation computing at the time, and I was an aspiring young computer programmer that had given up fitting in where I was and where I wasn’t. I was defining myself, as most teenagers do, but without the support systems most people take for granted. I built my own internal ones. This all lead me down paths into things of Japan. I read everything I could get my hands on, which was a sad amount in Trinidad and Tobago in the 1980s. Anime wasn’t even a thing yet (and I’m still not into that). But I found comfort and solid footing in Miyamoto Musashi’s, “The Book of Five Rings”, an accidental find at an old bookstore named Manhin’s on High Street in San Fernando. “Practice” became about everything I did, constantly seeking to improve things not for anyone else – it seemed I could never please anyone else – but I could please myself by getting better at even the smallest thing every day. My father back then insisted I polish my shoes back then, and I didn’t know how to do it. He was, of course, upset with me – but he never showed me how. No one ever showed me how until years later. The Twenties: The Navy, The Marines. Life happened, and then I was in boot camp – back then we had boots and shoes we had to polish; I’m not sure what they do now. I was clueless. Everyone in the barracks was doing strange things – some were heating the wax on provided irons for lack of an open flame, some weren’t heating the wax – but everyone was trying to polish their boondockers- the Navy workboots we wore. I tried my own way and was pretty consistent at failing to do it right. A friend of mine, Russell, saw me struggling and tried to help me – showing me the mechanics of it as in the link above, working one of my boondockers to a shine that boggled my mind. He talked me through the leather being porous, the wax being pushed in… the use of the water to lightly strip, that too much water stripped too much wax, that too little didn’t strip enough – and all of this was a lot for a tired Seaman Recruit. He finished one boot in maybe 30 minutes. I watched everything during that time. Then, I was tasked with making the other boot shine as well. 5 hours later, in the head (bathroom for you landlubbers), I got close enough and tired enough to get some sleep. It was an imperfect match the next morning, but Russell had given me what I needed to know. I just needed to practice. I don’t know how many hours I spent in boot camp alone with some polish, some water and those boondockers. I know that they got better and better as I practiced – sometimes I had to strip wax, sometimes I had to simply buff, sometimes I needed to add wax… but I got better. Kaizen. Later on I would end up working with the Marines as a Corpsman, and I was fortunate that I spent so much time out in the field because I was nowhere near as good as those Marines at polishing boots for inspection. Quietly, over the years, I practiced. Even when the military and I parted ways, it became something to do while thinking. Something that, originally, I was terrible at. Something that other people I know have simply stopped doing. When I returned to Trinidad and Tobago, my father had a pair of boots that he went stomping off in the dirt with. One day, mainly out of boredom though a part of me wanted to get back to his earlier disappointment, I polished his work boots to a point where he didn’t recognize them as the same. They soaked polish in, one small layer at a time, but within a few hours they were done. I left them there quietly, feeling that decades later I had accomplished something… except for one thing. I still wasn’t happy with them. Kaizen. It’s been about 30 years since my first attempt at polishing leather. I’m still not ‘the best’ at it, and I expect I never will be – but I can make my boots shine, it protects them, and while every morning some people think making their beds is the accomplishment that you should hold dear, I make sure my boots are serviceable to my standards every day. So no, it’s not as simple as a mechanical process I can explain to someone. It took 30 years for me to have my boots as serviceable as they are now – others just see the shine – and I know that should I last another 10 years, they will be better. How do you make your boots shine? The way you do everything else. You get in there. You do it. And every chance you get, you try to do it better. Improve on all fronts and your weaknesses will be stronger than the strengths you may lose. Plus, your boots will last longer.